May 7, 2015 1:02 am. Trifecta betting is common practice among horse racing bettors as it provides the potential for big returns. With many different forms of trifecta bets available, bettors have plenty of choice when it comes to placing their bets and now has never been a better time to put one on with bonus money being injected into trifecta pools. A trifecta is the only horse racing bet where you can win thousands for an outlay of only $1, making it not only fun, but one of the easiest and most profitable bet types in racing. A trifecta is a bet type where punters must select the first three runners home. 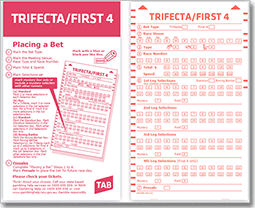 There are plenty of different options for trifecta bettors including straight, boxed, roving banker and percentage. The most popular form of trifecta is the boxed trifecta. This allows punters to select as many horses as they want — three or more — to run finish first, second or third. Unlike a straight trifecta, the selected runners can finish in any order and there is no maximum as to how many runners you can choose. The downside is a boxed trifecta costs more than a straight trifecta, as there are more possible winning combinations, but the chances of success are much higher. The cost for a three-horse box trifecta is $6 for a $1 unit, or $3 for a .50 cent unit. Common alternatives are the four and five-horse trifectas which cost more, but gives punters a better chance of success. A four-horse boxed trifecta costs $12 and a five-horse trifecta costs $60. Banker Trifecta’s are the lower cost form of trifecta, but are considerably harder to strike. It is a bet type where bettors must select horses to finish first, second and third in the correct order. The option to select more than one runner in each position is permitted. This option does cost more than your usual banker trifecta, but it gives you more flexibility than a normal straight trifecta. A three-horse straight trifecta costs $1 for a full unit, but each horse must finish in that exact horse. This is a very hard bet to be successful at and is often only seen in small fields. The banker option allows punters to select one horse to win the race, giving them more of a spread for the second and third options. If you anchor one runner with three horses for second and third, the cost for a full unit is only $6. You can also bet using a Roving Banker. This is where your banker trifecta is separated into three different bets. The banker can either finish first, second or third but you will only receive 33 per cent of the trifecta payout. Percentage Trifecta’s are another popular option as bettors can choose how much they want to spend on any race. Simply select your runners, enter the amount you want to spend, click either percentage or “Flexibet” and let the computer do the math for you. Calculating how much your trifecta will cost is sometimes harder than finding the winner. Listed below are the most common trifecta bets with their costs. Trifecta’s can get expensive if you’re looking to box a large amount of horses up, but the payouts are worth the increased expenditure. While the 2014 Melbourne Cup trifecta paid only $1704.30, other trifecta payouts on the same day included a $3463.40 payout in which the second favourite paying $3.90 won the race. To score a massive trifecta, you don’t necessarily need to pick outsiders, as all you need is a favoured runner to win with some higher-priced runners to finish second and third. Another trifecta on 2014 Melbourne Day, however, defied that belief as all runners were big odds. This trifecta was stuck and because the pools were so big, one punter went home a very happy customer. Placing a trifecta bet may seem daunting to some, but most online bookmakers make it a very easy process for Aussies. They offer easy to use layouts and plenty of options for bettors looking to place a trifecta. Here is a common example of what it takes to place a trifecta at an online corporate bookmaker. Head to the race you want to bet on, tick your runners under the “1st/Boxed” line and your preliminary bet slip will be on display. On this bet slip, bettors can either input the amount they want to spend, or input the percentage they wish to receive. The latter option will give the amount the bettors needs to spend, so all the hard work is done for you. Now, just click “Place Trifecta” and your selections will move to your final bet slip. From here, you can select whether you want tote odds or fixed odds. Then, click bet/submit and your bet will have been placed.